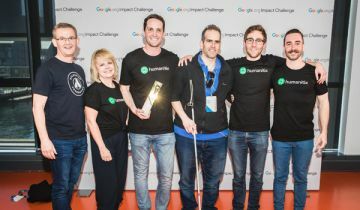 Humanitix was one of 10 finalists invited to pitch to a panel of judges that included Australia’s chief scientist Dr Alan Finkel, vice president of product at Google Anil Sabharwal, and Google vice president Jacquelline Fuller. The judging panel chose three winners, while Google also allowed the public to vote and determine the winner of a $1 million people’s choice prize. These companies included Humanitix, Xceptional, Hireup, and Orange Sky Laundry (People’s Choice). Hireup is also a Jobs for NSW supported company. Humanitix is disrupting the billion dollar ticketing industry with a new social enterprise ticketing platform which donates 100% of booking fee profits to charity. Humanitix developed its platform with a $25,000 grant from the NSW Government-backed Jobs for NSW and received an additional $100,000 grant to scale up and compete with some of the nation’s largest ticketing companies. In June, it also received $1.2 million in funding from the Atlassian Foundation. The rapidly expanding Humanitix was formed in August 2016 by hedge fund manager Joshua Ross and engineering graduate and former technology consultant Adam McCurdie, and has since ticketed more than one thousand events. Mr McCurdie said winning the challenge was an amazing experience and an incredible opportunity to be backed by one of the most influential technology companies in the world. 'The funding and support is transformational to our organisation. This will allow us to better service more events across Australia and beyond, disrupting the $50 billion ticketing industry into a force to tackle global inequality,' he said. Humanitix will now be scaling up its team of nine 'significantly' as it looks to transform the events ticketing industry to make it more accessible to people with disabilities. Mr McCurdie said the Google Impact Challenge involved a range of screening and judging processes over six months, including written applications, one-on-one interviews and then the final pitching to the judges. 'We not only receive funding from Google but we also have the privilege of leveraging Google's technical resources and technology innovations to provide a better product experience for our event organisers and their customers,' he said. Deputy Premier and Minister for Small Business John Barilaro said Jobs for NSW had been there from the start with Humanitix, having earlier provided the company with a Minimum Viable Product grant to develop the ticketing platform. 'Now we are supporting them to expand with a Building Partnerships grant which will see the company hire new staff, refine their software and continue to scale with new customers and partners.